My diet won’t be 100% Paleo. Well, I simply don’t believe in cutting out ENTIRE food groups of your diet. I am a Marketer, not a Dietitian, but I believe food groups exist for a reason. And let’s be real, I am not giving up coffee or wine until I have a small child growing inside of me. Cook 2-3 slices of bacon on medium heat. I prefer the thick-sliced bacon, for obvious reasons. While the bacon is cooking, pour yourself a glass of grapefruit juice (no sugar added). Pre-heat a small frying pan on medium heat and add a little drip* of olive oil. Crack two eggs into a small bowl and use the egg whites only. Crack open on more egg and keep the yolk this time. Blend the eggs together with a fork. Pour the eggs on your small frying pan with olive oil. Cook the egg flat until golden brown (a few minutes), fold over, and finish cooking for 45 seconds. Place the omelette on a small plate and cut it down the middle. Spread 1 tablespoon or so of goat cheese on each of the omelette halves. Grab your tomato and cut two small slices for your omelette. Place one slice on each omelette halves. Slice an avocado, and save half of it for later. Click here if you want tips on how to cut your avocado perfectly. Place two slices of the avocado on each of the omelette halves. 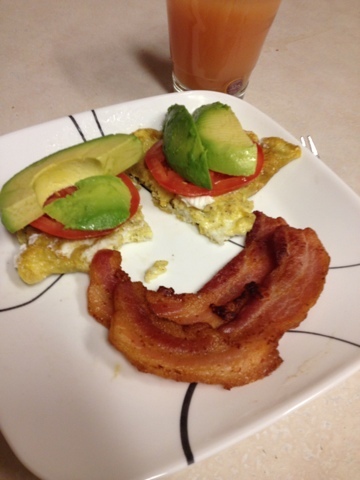 Finally, add your cooked bacon at the bottom of the plate and complete your smiling so-cal omelette.